Birthmarks are patches of discolored skin on a child’s body. They may be born with them or they my just appear some months after the baby is born. Birthmarks are quite common, with more than 80% of babies having them. Many birthmarks stay on forever but some fade with time as the baby grows. They can either be pigmented or vascular. Vascular birthmarks come about from blood vessels under the skin’s surface and may be in a range of colors from pink and all the way to pink and bluish. This depends on how deep the blood vessels are. Pigmented birthmarks are as a result of pigment cells developing abnormally and can be gray, brown, black or bluish. Birthmarks are of different shapes, colors and sizes and have no particular place they can show up. Anywhere is fertile ground. They come with different names but the most common are salmon patches, angel kisses, stork bites and vascular stains appearing on almost 70% of babies. They appear as purple or pink blotches on the skin and come about as a result of dilated capillaries close to the skin. It becomes easier to notice them when the temperature changes or the baby cries. Stork bites are those that appear at the back of the neck and are more likely to go into adulthood. Those that appear on the eyelids and forehead, known as angel kisses, will usually disappear by the age of two years. Mongolian spots – Appearing as bluish or grayish flat spots on the buttocks or lower back, these are more common in those with dark skin. They fade by school-going age but never quite disappear. 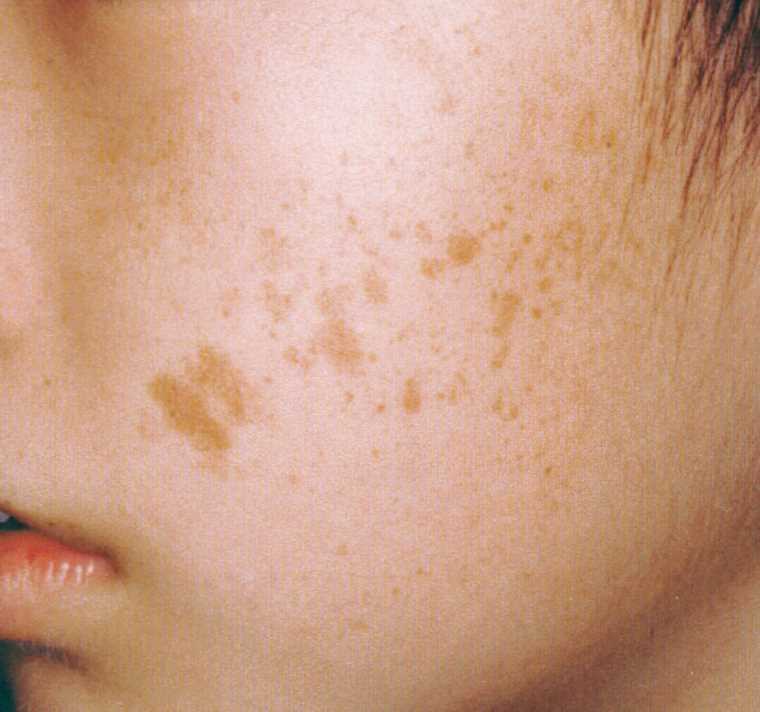 Café au lait spots – These are light brown patches that could also come in groups or multiples. They occur in 20 to 50 percent of babies, may get darker when exposed to the sun and usually reduce in size or fade as the child grows. Port-wine stains – Also known as nevus flammeus, these start out at birth as pale pink to dark purple patches and usually grow bigger with age. They may also darken, become thick and form small lumps on the skin surface. Hemangioma – These are growths formed by blood vessels. They are more common in twins, girls and preemies and can vary in size. Compared to other kinds of birthmarks hemangiomas grow very fast. They appear within the first six weeks after birth but only 30 percent may be visible at birth. Many grow for about a year and then begin to reduce in size and turn white, taking between three and 10 years to do so. Most birthmarks pose no harm and may even disappear with no intervention within the first years of a child’s life, according to Seth Orlow, a professor of pediatric dermatology at New York University School of Medicine. Like many other occurrences, there are exceptions to this. About 40,000 children in the U.S. have birthmarks that require some form of medical attention. It is therefore of utmost importance that you have your child’s birthmarks checked by a doctor. How a birthmark is treated will depend on the type of birthmark it is. Hemangiomas, for example, may require laser therapy or surgery. Other treatment options for other types of birthmarks include oral, topical, or oral beta blockers. The surgical methods may, however, leave some scarring. In the event that your child’s birthmark doesn’t fade, you will have to help them deal with it. It takes a lot of confidence to walk around with a permanent scar on any part of the body. Things become a little more complicated if the scar is somewhere visible and on a child. Children can be brutally honest and this sometimes comes off as insensitive. As a parent, talk to your child about the mark and have them understand what it is. Teach them to explain what it is and to be comfortable in themselves regardless of what anyone else says. They might as well get used to the mark if it is there to stay.